Who could do with a little more SCHEMA ST4 in their professional life? But only a little bit more? For example, maybe only the approval process is relevant to one colleague, while somebody else wants to be informed about publications and translations and another person just wants to request the creation of a single datasheet. SCHEMA ST4 is intentionally very comprehensive so that it can meet the demands of all the everyday tasks involved in the technical writing process. With workflow automation, you can make sure that colleagues only have access to the parts of our component content management system that they really need. Technical writers are dependent on many other departments. For every new or altered product, information must be collated from different areas of the company. Information also needs to be made available for internal users: colleagues need data sheets, product information, reports and much more. All of this ultimately leads back to the component content management system with the technical writer as the intermediary. Automation and workflows have long been at the heart of our development as we strive to lessen this workload in the technical writing department. In SCHEMA ST4 2018 you can already use the new Workflow Designer to begin adjusting the software’s standard workflows as well as to define your own workflows and to create automated procedures. 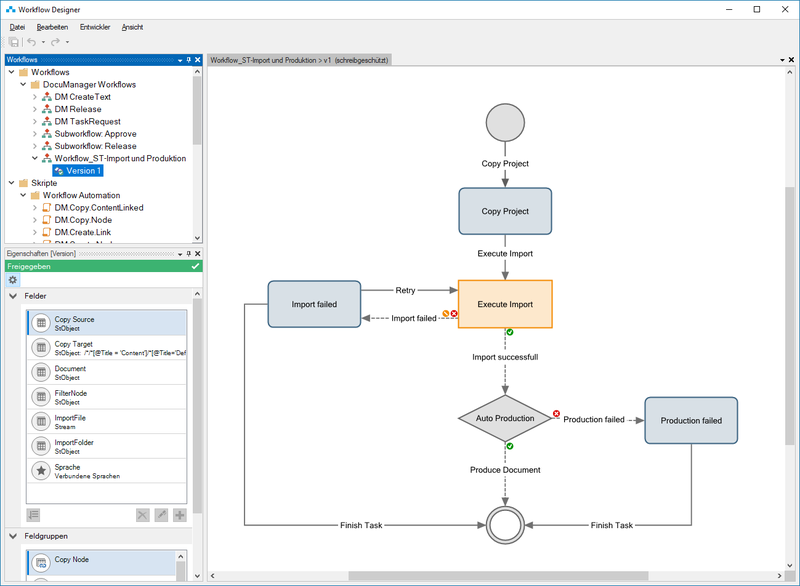 Now a large selection of further functions is available to map processes in even greater detail with the new Workflow Automation Library. Our goal is for technical writers to be able to make ST4 available bit by bit to product experts within their own company. Many colleagues outside of the technical writing department only need parts of SCHEMA ST4 to accomplish their tasks, but in most cases they would rather turn to the system experts – the technical writers. Workflows make it easier to exchange information between departments or with product experts. For example, following approval, e-mails can automatically be sent to interested parties, or colleagues outside of the department can use a wizard to generate their own data sheet. Reports are regularly and automatically created, sent and archived. This means that a strict filing structure is automatically maintained. Workflows can also be used to send information from SCHEMA ST4 to other systems. However, there are many more possibilities with workflows – and we are giving you the necessary tool to unlock this potential. So let SCHEMA ST4 surpass the boundaries of your authoring department and create a more precise internal structure. Workflows also guarantee that important processes in the technical writing department are supported by a software support system that ensures no information will be lost. While, on the one hand, workflows lead to smooth collaboration with product experts, on the other, they ensure that your colleagues can work independently with SCHEMA ST4.